This audio collection featuring 13 professional speakers (9 hours on 12 CDs) comes with 1 Bonus DVD on how to overcome nervousness on stage. Gain the confidence to be a charismatic speaker with this complete guide to becoming comfortable with public speaking. Public speaking is the most common fear, but it doesn’t have to be a roadblock on the path to your success. Whether you’re speaking to five or five hundred, you can learn to do it with confidence and charisma. Advice from some of the world s most inspiring speakers is gathered right here. These powerful tips and techniques will help you develop winning material, mentally prepare, and communicate a powerful message. Besides the basics of public speaking, you ll also learn how to think on your feet, play off your audience, and banish anxiety. Make your next speech a dynamic presentation full of energy and personality. (Featured Speakers: Brian Tracy and Les Brown and Patricia Fripp and more). This series of training audios includes exceptional speakers sharing their tricks of the trade with multiple points of view. The world’s leading experts on public speaking range from business strategists, communications experts, and Guinness Book of World Records holders to bestselling authors and award-winning physicians who have overcome their very own phobia of public speaking. LES BROWN is one of the world’s most sought-after motivational speakers. Les Brown presents to Fortune 500 companies all over the world. His “heart-felt” style and tremendous passion for speaking leaves his audiences with a larger vision for their lives and the motivation to take the next step. BRIAN TRACY is one of the most respected speakers, teachers and trainers in the world today. He has given more than 5,000 seminars and workshops in fifty-five countries on the subjects of sales, wealth creation and goal setting. He is the author of more than 400 audio/video learning programs and has written fifty-two books that are published in thirty-six languages. GREG REID is a best-selling author, entrepreneur, and the CEO of several successful corporations, who has dedicated his life to helping others achieve the ultimate fulfillment of finding and living a life of purpose. Reid’s work has been published in 31 books, 12 bestsellers, and 8 #1 bestsellers, and can be found worldwide. His unique style has made him a highly sought-after keynote speaker for corporations, universities and charitable organizations. 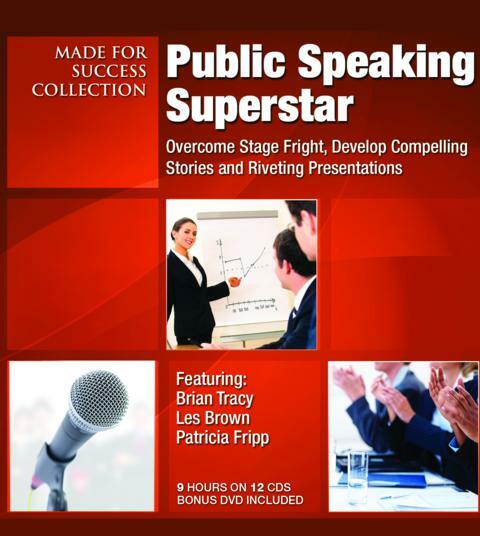 PATRICIA FRIPP is hailed as “one of the country’s 10 most electrifying speakers,” this award-winning author, trainer, and executive speech coach offers an insider’s guide to dazzling presentations. CHRIS WIDENER has shared stages with top political figures and professional athletes, share with you the secrets he has shared with executives at G.E. and Harvard Business School. RON WHITE: Tap into your latent brainpower with tips from the Guinness World Record-holder for memorizing a 28-digit number in 1 minute and 15 seconds. DIANNA BOOHER is a prolific author of 43 books in more than 25 languages, including The Voice of Authority and Speak with Confidence. Successful Meetings magazine has named her to its list of “Top 21 Speakers for the 21st Century.” Booher Consultants, Inc. offers communication training: oral, written, interpersonal, and organizational.